Freelock built an informational website for the Northwest Wall & Ceiling Bureau (NWCB), an international trade organization for the wall and ceiling industry. We delivered a snappy and dynamic site that provides resources for products, services, standards, and best practices to contractors, architects, suppliers, manufactures and others. The site includes user profiles for individuals and businesses, a photo gallery, and registration for industry events. 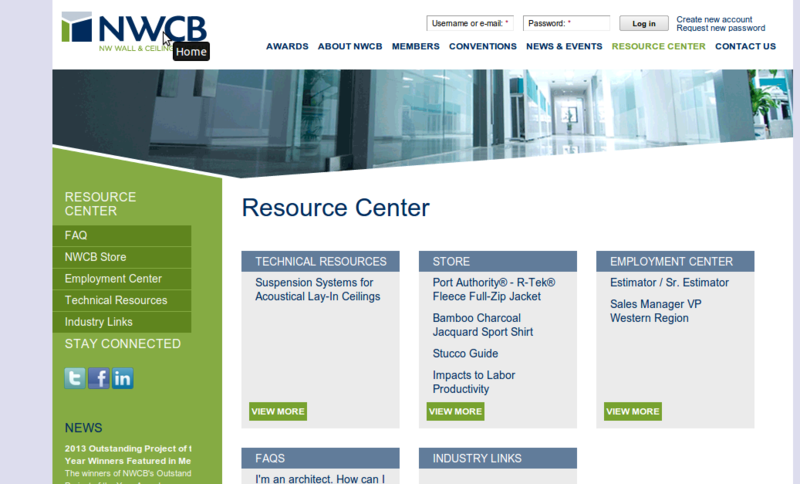 In addition, Freelock created a second website for NWCB's annual conference and trade show. Alongside options to register for the conference and sign up for a booth at the trade show, Freelock custom-built a mapping system for NWCB allowing registrants to individually select their banquet seats and booth location during the conference. Freelock is committed to providing clients the website functionality they need, even in cases where custom development is necessary. Freelock partnered with Eben Design, a Seattle-based graphic design firm, in the creation of both websites. Freelock's connections in the web development industry make us an invaluable ally for any type of web work. Eben Design worked closely with our team and we collaborated for a stronger site than either company could deliver individually. Eben handled the design and Freelock did the development. In the case of NWCB, the results were breathtaking. Learn more about Eben, and be sure to consider them for your next design project.